How many ways do you celebrate Thanksgiving ? 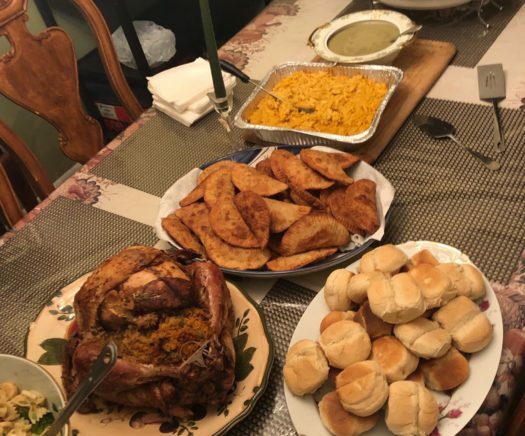 Victor Valdez is showing the dishes his family uses in Thanksgiving. Each year Thanksgiving is celebrated to come together as a family to give thanks for what has happened throughout the year. , but not everyone’s Thanksgiving is the same. No one comes from the same heritage since everyone is different, but the traditional dishes in Thanksgiving are usually turkey or ham, stuffing, sweet potatoes, mashed potatoes, and cranberry sauce. Many of the foods and traditions aren’t always from one region of the world. The nations that have their own ways of celebrating Thanksgiving are Germany, Japan, Canada, and Norfolk Island. In Germany, a holiday called Erntedankfest, which is a harvest that gives thanks and good fortune that takes place the first Sunday of Oct. Festivities usually take place in churches in a more rural area. Most times one may have an opportunity to wear an Erntekrone, which is a harvest crown that’s made of grains, flower, and fruit. Typically chicken, rooster, hen, and geese are prepared for the feast. In Canada it’s called l’Action de grâce falls on the second Monday in Oct=. which was first celebrated in 1578. Although the food is very similar to a tradition Thanksgiving in America. Canada feast on turkey, stuffing, mashed potatoes, gravy, and corn. Eventually becoming a national holiday in 1879, the day was moved from Nov. 6, resulting in the second Monday of October. In Japan their holiday is called, Kinrō Kansha no Hi. This is a national public holiday is celebrated yearly on Nov. 23. This holiday was carried on from ancient harvest festival rituals named Niinamesai, which means a “celebration of hard work and community involvement”. Kinrō Kansha no Hi became official in 1948. The reason behind this was to celebrate the rights of workers in post-World War II Japan. Now this holiday celebrated with labor organization led festivities, and the children creating gifts for the police officers. Norfolk Island, Thanksgiving came about when Isaac Robinson suggested decorating the All Saints Church with palm leaves and lemons. This was done in hopes of bringing in whalers to the Thanksgiving service/celebration. Although Robinson passed away prior to the previous Thanksgiving, it eventually caught on. Now families bring fruit and vegetables to church to celebrate, tying corn stalks to pews, and decorating the altar with flowers on the last Wednesday of November. Thanksgiving is the holiday of the food and traditions but it’s never celebrated the same. “Mac and cheese, ham, turkey, green bean casserole, rice, pie, banana pudding, and similar dishes,” said Junior, Daniel Martinez. “The table tends to be really full. It depends on the situation. It usually takes a day and a few hours to finish everything“. The different ways of celebrating this holiday have its own unique ways to be grateful about. Taking time to decorate and preparing the feast is one major similarity every Thanksgiving will have.